After letting my base coat dry, I applied 2 coats of Pirate (which is an AMAZING jelly like red creme) on the thumb, 3 coats of Rose Cache to index, ring and pinky, and 2 coats of Kabuki (again with the amazing, hot pink creme). While the ring finger was wet, I applied loose glitter in heart shape using the smallest dotting tool I have, It's almost a point and it picks up the glitter one at a time. Let the other fingers dry COMPLETELY. And then I stuck on my very own self made heart cut-outs from blue electrical tape and painted on hearts for the index and middle finger - then take off tape! 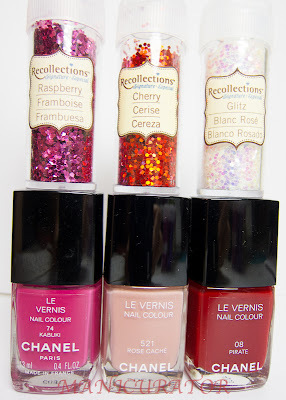 While those were still wet I added the loose glitter one by one. Pink for the index and alternating pink and red for the middle. 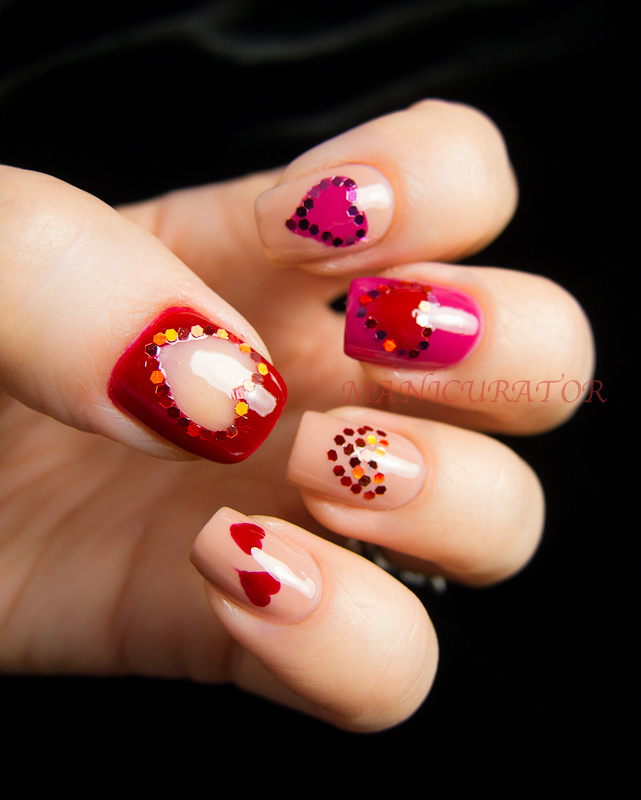 To complete the pinky, I dotted on the two little red hearts. The thumb was more difficult. 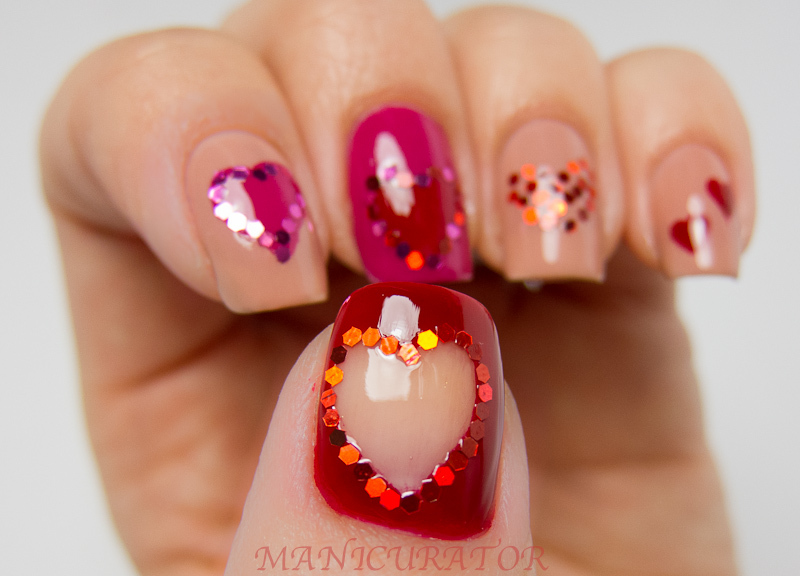 Once the heart cut out piece of tape was on the nail, I used acetone to remove the polish inside the heart! To finish it, I applied a coat of clear and loose glitter one by one. You know I top coated all this with Seche Vite. PHEW. This is gorgeous! Did you apply the glitter using tweezers? OMG this is waaaaay too cute!!!! Love this! OMG this is ADORABLE!! So freaking cute! 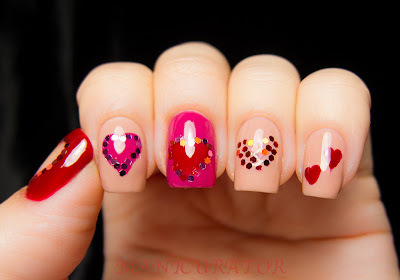 Awww this is so cute:) it reminds me of valentines day! 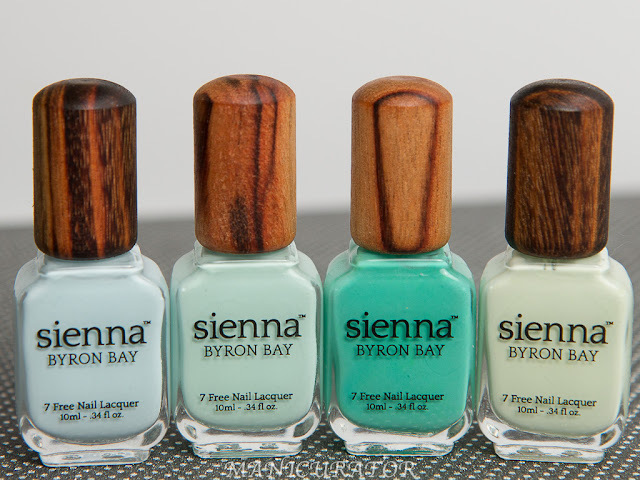 Aww, this mani is adorable! You should definitely recreate something like it next february. this is adorable and really well done!! Too cute! You are so creative again! I am in love with this manicure (no pun intended :) ), and I love what you said about the Chanels! Your thumb looks so cool!! I'm gonna have to remember this one next February. Love this mani - it looks awesome. And the thumb is my favorite. 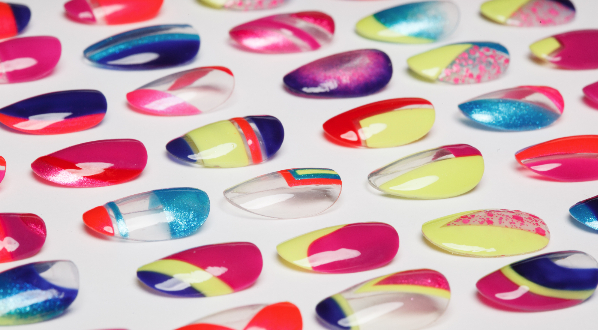 I love the window through the nail polish. 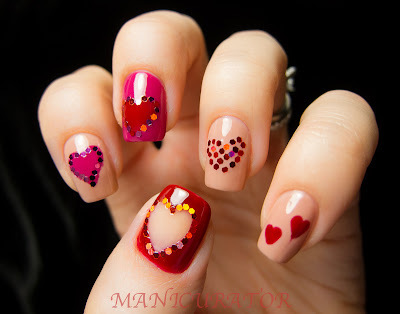 Love the thumb nail. The whole mani is very pretty. Keep up the good work! Adorable mani! The thumb looks amazing! WOW! I am in love with these nails. Seriously, they are sooooo beautiful. You are SO talented. Thanks for sharing. I love your blog, its amazing!